OTTAWA, Ontario, Canada, December 20, 2013 (ENS) – The Joint Review Panel for the proposed Enbridge Northern Gateway Pipeline Project today recommended that the federal government approve the multi-billion dollar pipeline, subject to 209 required conditions. 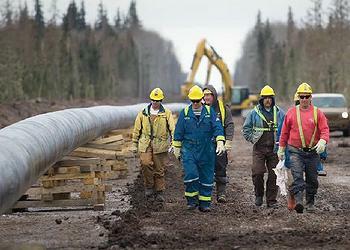 The Government of Canada is expected to make its final decision on the pipeline by July 2014. Conservation groups condemned the decision, saying that the three-member panel’s recommendation ignores overwhelming scientific evidence against the pipeline and widespread public opposition. The Enbridge Northern Gateway Project Joint Review Panel consists of Sheila Leggett, vice-chair of the National Energy Board; Kenneth Bateman, an energy lawyer; and Hans Matthews, a professional geologist with Aboriginal community development experience. The Enbridge Northern Gateway Project involves the construction of two pipelines and the construction and operation of the Kitimat Marine Terminal. The two pipelines are each approximately 1,170 kilometers in length. They would run from Bruderheim, a small town in the Edmonton Capital Region of Alberta, to Kitimat, British Columbia, a small town at the head of the Kitimat Arm of the Douglas Channel, a deepwater fjord, where an aluminum producer is the main employer. Enbridge plans call for one 914 millimeter (36 inch) diameter line to carry 525,000 barrels per day of petroleum products west to Kitimat. The other line, a 508 mm (20 inch) diameter pipeline, would carry on average 193,000 barrels of condensate per day east to Bruderheim. Condensate is used to thin thick, heavy petroleum products for pipeline transport. 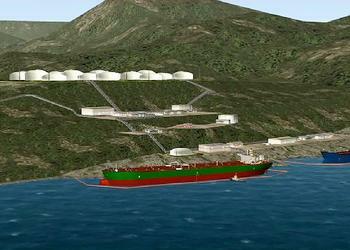 The new Kitimat Marine Terminal would have two ship berths and storage for three condensate tanks and 11 petroleum tanks. It would include a radar monitoring station and first response capabilities. The project would be developed by Enbridge, Inc., a Canadian crude oil and liquids pipeline company. “We submitted hundreds of pages of scientific evidence on behalf of our clients that lead to one emphatic conclusion – the Northern Gateway pipeline is an unsafe, unsustainable and unnecessary project, and it does not serve the national interest of this country,” said Ecojustice lawyer Barry Robinson. Ecojustice lawyers represented the nonprofit groups ForestEthics Advocacy, Living Oceans Society and Raincoast Conservation Foundation during the lengthy review process. “While we are deeply disappointed with the Joint Review Panel’s recommendation, this does not mean the pipeline is approved or will even be built,” Robinson said. The panel’s recommendation comes after more than 18 months of hearings held in communities along the route of the proposed pipeline. 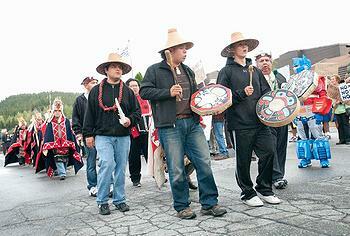 The Northern Gateway Project team filed its formal application with the Panel in May 2010. The team has been engaging in outreach with Aboriginal groups and stakeholders for more than 10 years. Holder said the Northern Gateway Project team will work to meet the Joint Review Panel’s conditions. The team will also work towards meeting British Columbia Premier Christy Clark’s five conditions for heavy oil pipeline development, of which the Panel’s recommendation is one. Although a long-standing moratorium on new tanker traffic has kept Canada’s west coast relatively safe from spills, the Northern Gateway pipeline would clear the way for up to 255 new tankers to carry bitumen through the narrow passages of British Columbia’s north coast to Asian markets each year. The 1,177-km pipeline would cross hundreds of fish-bearing streams, rivers and lakes and fragment untouched tracts of wilderness and endangered animal habitat. It will also cut through the traditional territories of more than 40 First Nations and Aboriginal groups, many of whom stand in opposition to the pipeline. Leaders of the First Nations Summit and the Union of BC Indian Chiefs are calling on the federal government to reject the Joint Review Panel’s recommendation. “The Joint Review Panel decision to provide conditional approval does not alter or negate in any way, the federal government’s clear legal responsibility to consult and accommodate First Nations, especially given the precedent provided by a long list of Supreme Court decisions,” said Grand Chief Edward John of the First Nations Summit political executive. “The necessary consultation standard for any development project in BC, especially those with such a high potential for negative impacts, must be to seek the free, prior and informed consent of each and every First Nation whose Aboriginal title and rights will be impacted by a proposed project,” said Grand Chief John. “We shall fully exercise our rights and inherent jurisdiction rooted in our Indigenous Laws and Indigenous land rights to defend our lands, waters and the safety and well- being of our Peoples,” said Grand Chief Stewart Phillip, president of the Union of B.C. Indian Chiefs. “Today’s recommended approval with conditions stems from a fundamentally and fatally flawed process where as a matter of record, the overwhelming majority of presentations made to the Panel here in B.C. expressed grave concerns, distressing facts and a shared belief the project should not proceed. The Northern Gateway Project is being vehemently opposed by Indigenous Peoples who will not put their territories, waters and communities at risk,” said Grand Chief Phillip. At least 95 percent of written comments submitted to the review panel, including submissions by the Province of British Columbia, oppose the proposed Northern Gateway pipeline. 2013: In June, the Canadian National Energy Board forced Enbridge to disclose safety measures in place at 125 of its pumping stations. The disclosure revealed that 117 of 125 pumping stations were in non-compliance to safety rules set out by the National Eenergy Board. The NEB rules broken included lack of backup power at all but eight stations and no emergency shutdown at 83 of its pump stations. 2012: In July, 190,000 liters of crude oil spilled in Wisconsin just one month after a 230,000 liter leak near Red Deer, Alberta. 2011: On the first day of the public hearings into the company’s proposed Northern Gateway pipeline, U.S. pipeline regulators informed Enbridge of a leak from its Stingray pipeline, which carries up to 560-million cubic feet a day of natural gas from offshore wells in the Gulf of Mexico. The pipeline leak occurred about 100 kilometers (60 miles) from the Louisiana coast. 2010: Over 19,000 barrels of heavy crude oil were spilled into the Michigan’s Kalamazoo River, where cleanup is not yet completed. 2008: an Enbridge pipeline installation in Wisconsin incurred more than 500 regulatory violations in one year of construction.